Right after Stacey Parker, GATEways horticulturist, bought her home, the first thing she did was start removing her lawn using sheet mulch (layered cardboard). 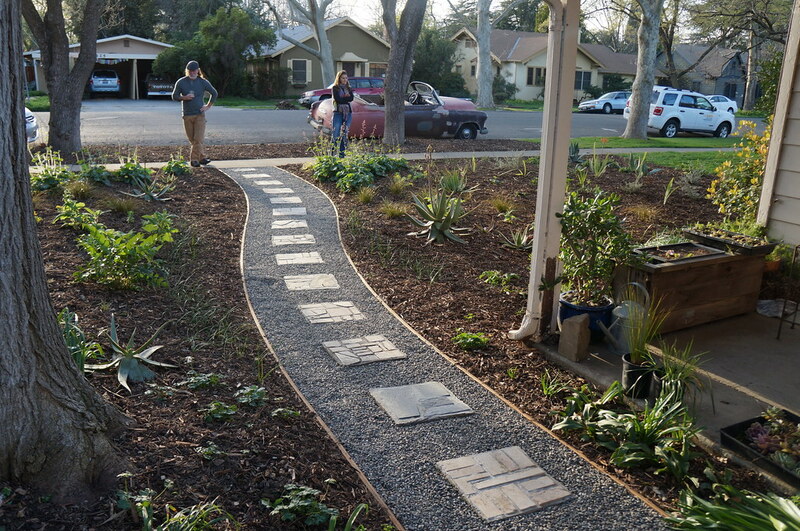 Her initial lawn removal, as well as the evolution of her yard from turf to low-water plants for shade, is well documented in stories published by The Davis Enterprise and popular posts on the UC Davis Arboretum and Public Garden’s blog. Now, about a year and half later, Stacey’s yard continues to thrive. Although most people would consider this yard complete, given its variety of interesting, low-water plants with a multitude of beneficial wildlife properties, the burgeoning designer in Stacey is not done. “If I started with a plan, I may not have felt I needed to take any plant I could get. I made it work, but now I want structure and a variety of vignettes,” explains Stacey. “Actually, I can’t believe I’m even saying that! This project has really expanded my appreciation of landscape design and pushed the boundaries of my background in urban horticulture!